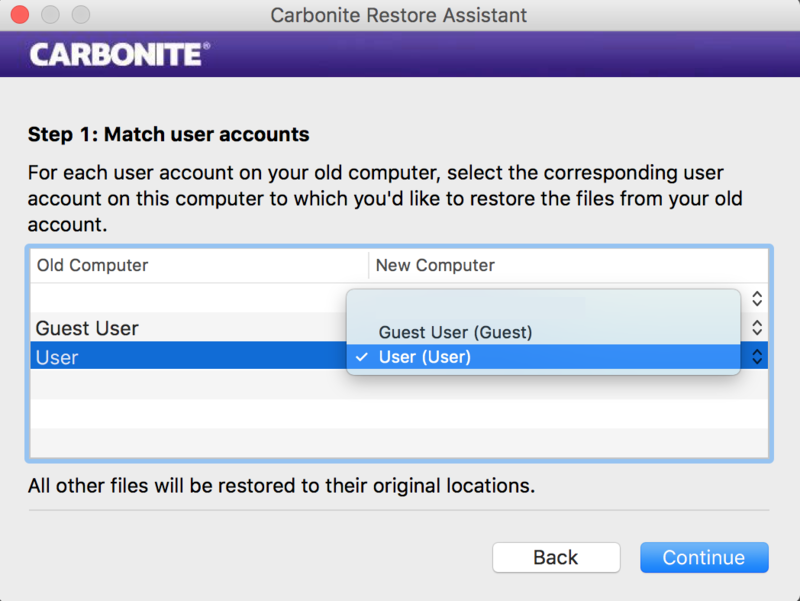 Just a note before you begin: Carbonite doesn't currently support the ability to do a full restore from a PC to a Mac or vice versa. 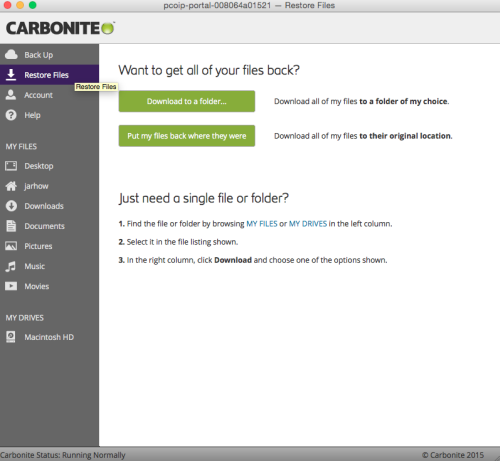 If you're trying to do this, you can use Carbonite's Anytime Anywhere Access feature. This web feature lets you select and download some files from your backup to any Internet connected computer. You can install and restore your files in a few easy steps. Click the title of each step to display the associated instructions. 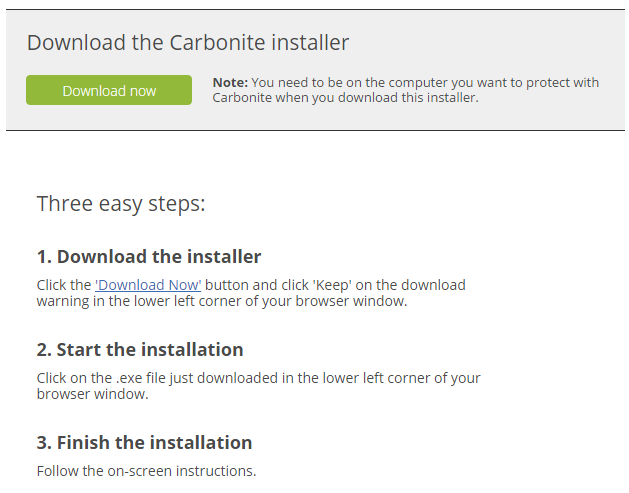 If Carbonite is already installed, skip to the Troubleshooting section and review the information for What to do if Carbonite's Already Installed. That section will also walk you through finding the version of your Carbonite software. Otherwise, sign into your Carbonite account at https://account.carbonite.com using your email address and Carbonite password. You'll be asked if Carbonite is already installed. Click No, then Next to proceed. 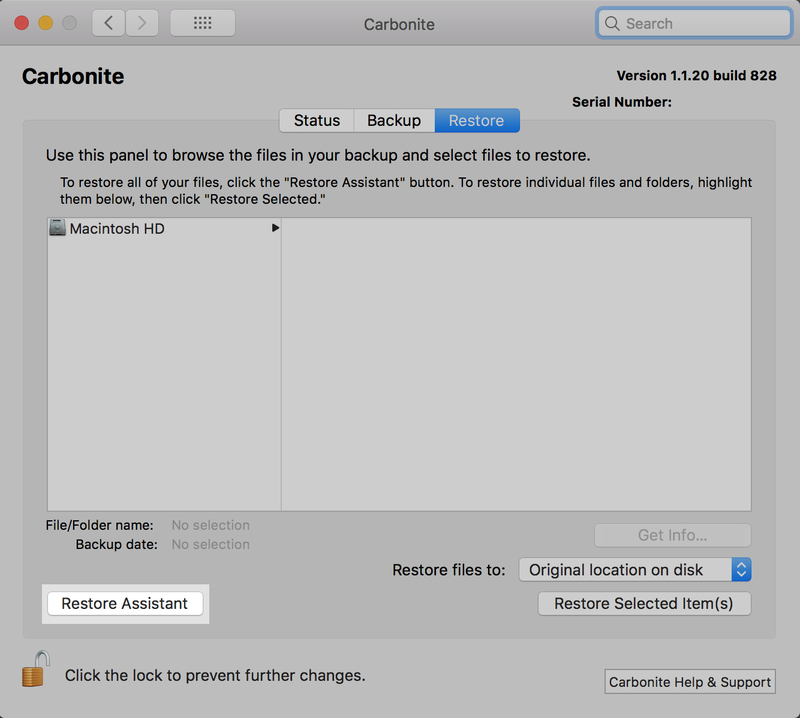 If see a screen labeled Carbonite Restore Assistant during the installation, you are running version 1.x of the software. 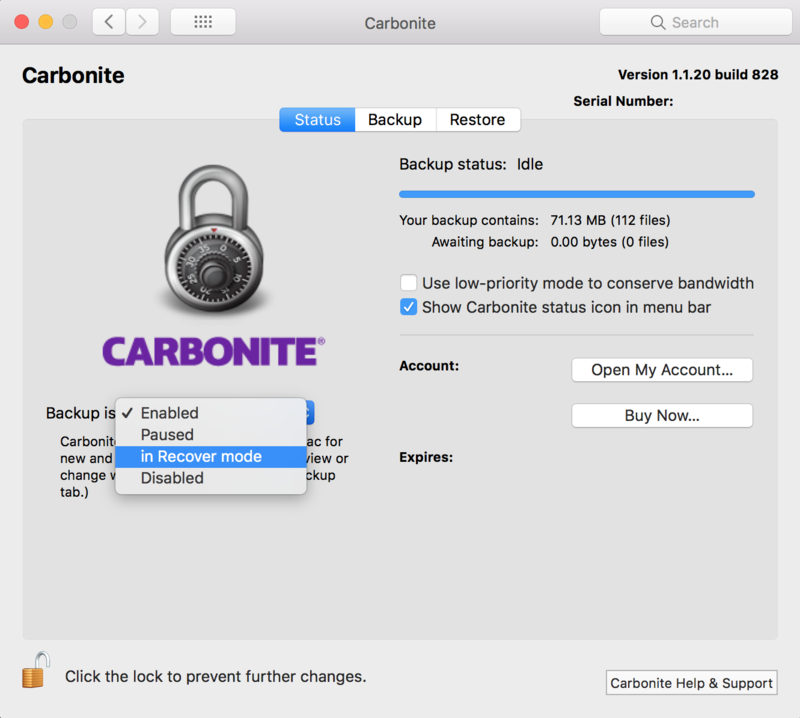 If see a screen labeled Move Carbonite Backup to this Mac during the installation, you are running version 2.x. 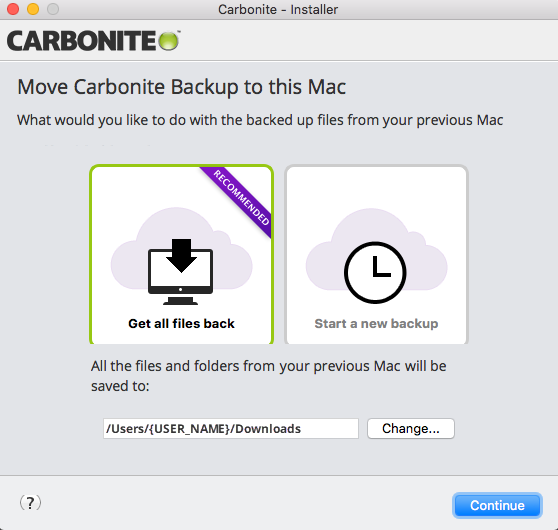 If Carbonite is already installed on the computer you're restoring to, please skip to the Troubleshooting section and review the information for What to do if Carbonite's Already Installed. 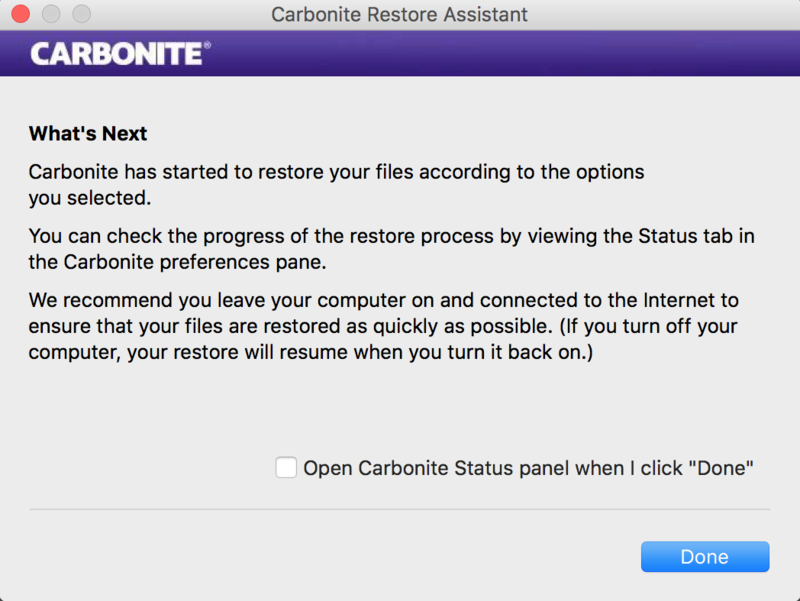 It is strongly suggested that you keep your computer on keep Carbonite in Recover Mode until the restore is complete. 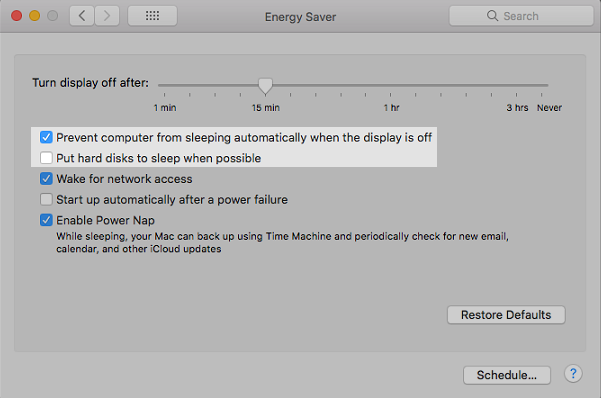 You can find out how to adjust your sleep settings by proceeding to Step 3 below. During the installation, you'll have the option to either restore your files or to start a new backup. To restore your files, use the Change button to select a restore location, then click Continue. 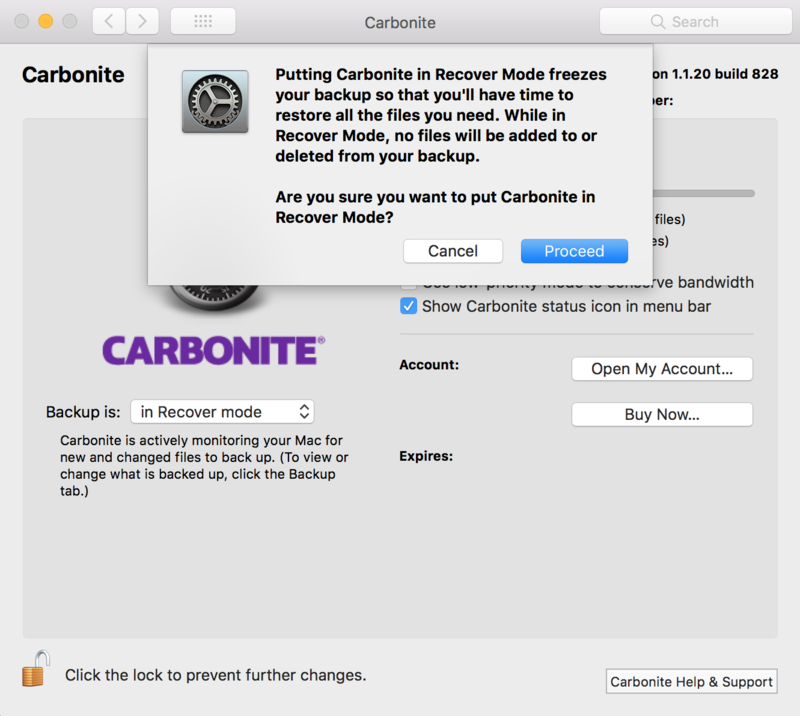 If you don't see the progress of the restore displayed, click the File Recovery tab in the Carbonite User Interface. To change these settings back later, follow these instructions again. 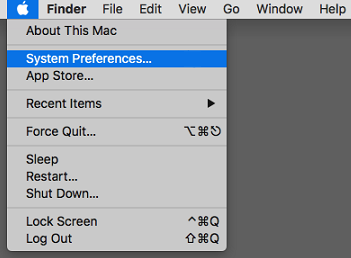 When you reach the step for adjusting the settings to Never, click Restore Defaults instead. At this point, your restore will progress automatically. You can use your computer as needed, but please try not to move or delete any restored files while the restore is happening to avoid potential issues. 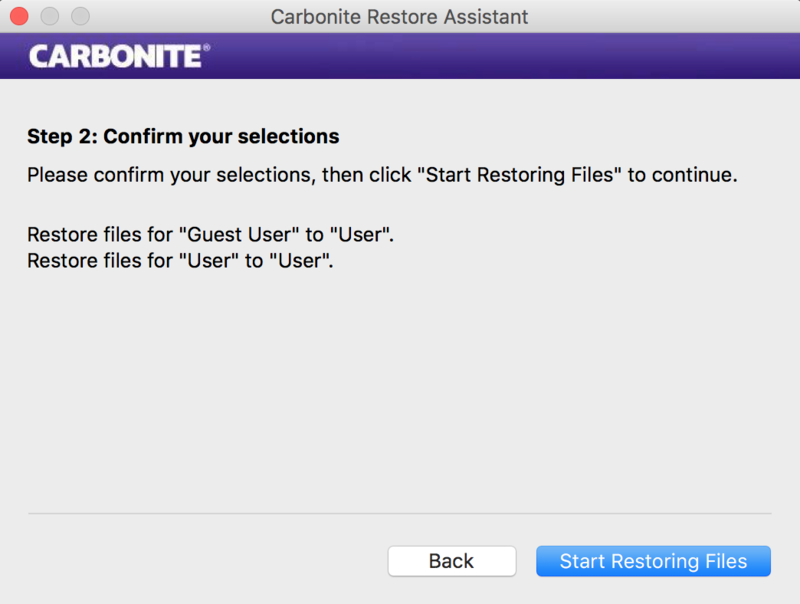 After the restore is finished, please use our post-restore checklist article to guide you through what to do after a restore completes and ensure you are ready to continue using Carbonite. This section addresses the most common issues and questions that may occur during a restore. If you've already started your restore, you're all set: it will progress automatically. If not, let's walk you through opening Carbonite and starting a restore. 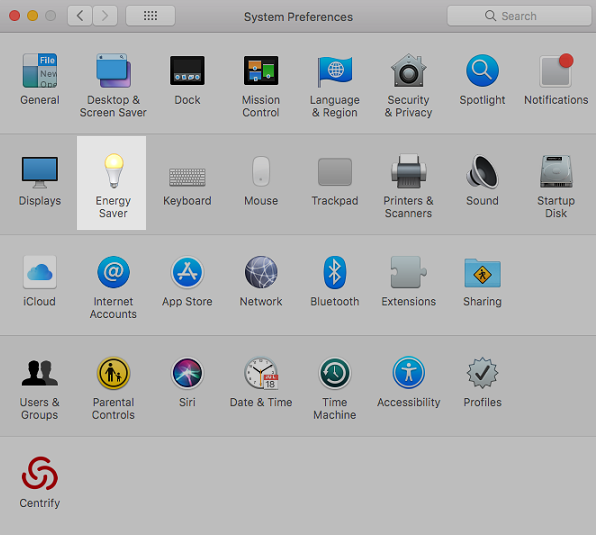 If you see a black lock icon (left), you're running version 1.x of the Carbonite Mac client. If you see a green dot icon (right), you're running version 2.x of the Carbonite Mac client. With the Restore Assistant open, please click this link and use the instructions to finish your restore. A confirmation pop-up window will appear. Click Continue to start the restore. You'll see the restore progress display on your screen. From here, you can sit back and relax as your files are restored to your computer. 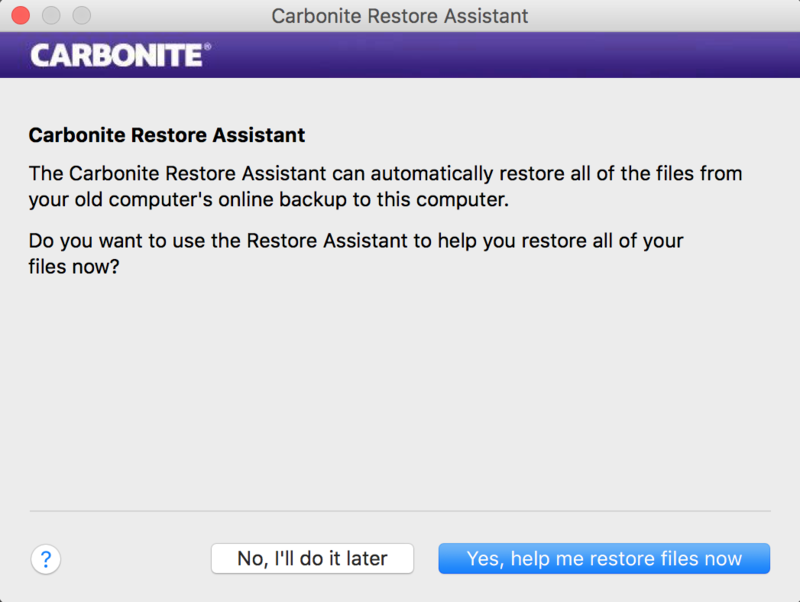 If you close and reopen the Carbonite user interface or if your computer restarts during the restore process, the restore progress bar may reset 0%. There's no need to worry: your restore isn't actually starting over from the beginning. In these cases, the progress bar restarts at 0% of what is remaining to be restored. Everything that was restored before this happened is still on your computer and available to use.